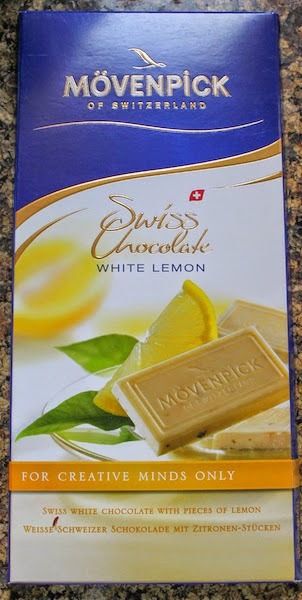 The third in my candy bar series, a white chocolate lemon bar from Movenpick was the inspiration for these fluffy, lemon muffins flavored with yogurt, lemon zest and said white chocolate lemon bar. 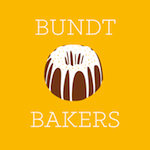 I’ve been experimenting lately with some gluten-free baking because one of my friends here is gluten-intolerant. 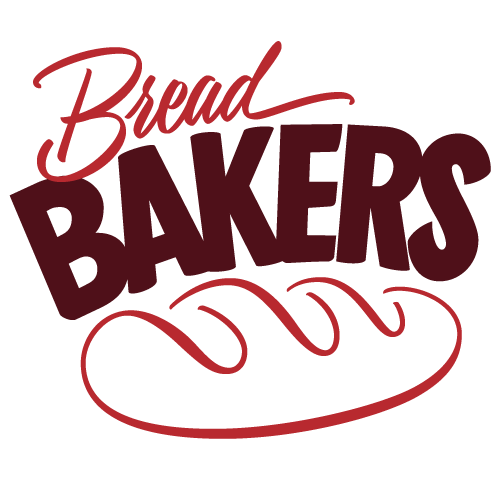 What I have found is that I can pretty much replace the normal flour with a gluten-free mix, (I like the Dove Farms White Bread Flour because it has a little added natural gum.) if I weigh the flour and use 125g per needed cup. It seems that the flours used to make up the gluten-free mix, in this case rice, potato and tapioca, must be lighter than wheat so a cup of the flour mix is just not enough flour. 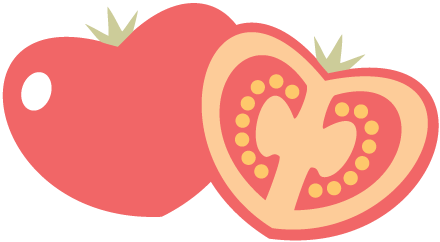 By weight, it's perfect. One last change in the recipe involves method. 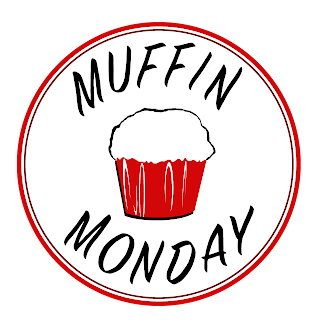 In most muffin recipes, one adds the wet ingredients to the dry and folds until they are just combined. With gluten-free flour blend, you need to make sure no flour still shows. In other words, mix well. 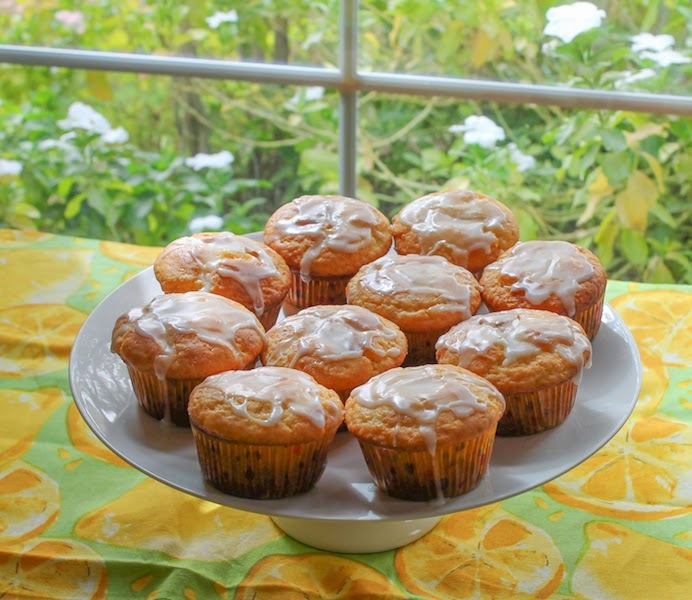 I made these muffins with the gluten-free bread flour today and they were light and fluffy and, frankly, one of the best sweet muffins I’ve ever eaten. 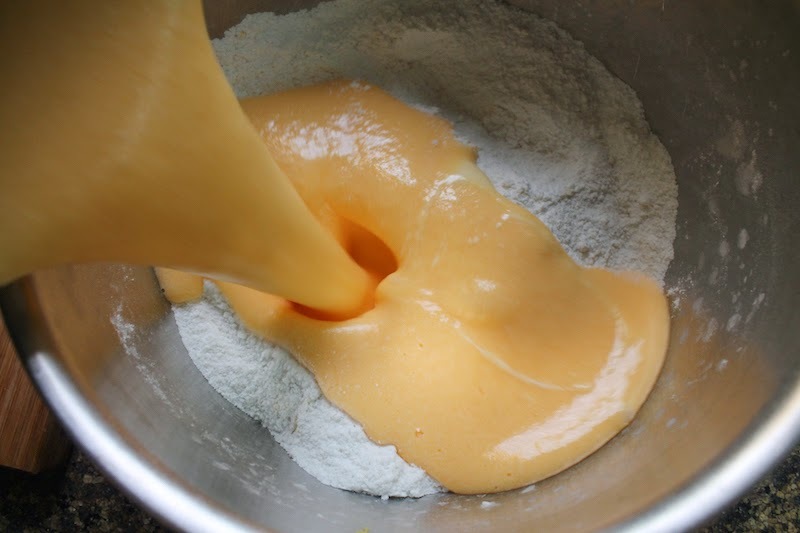 Add the flour, baking powder, baking soda and salt to a large mixing bowl. Grate in the lemon zest and mix. 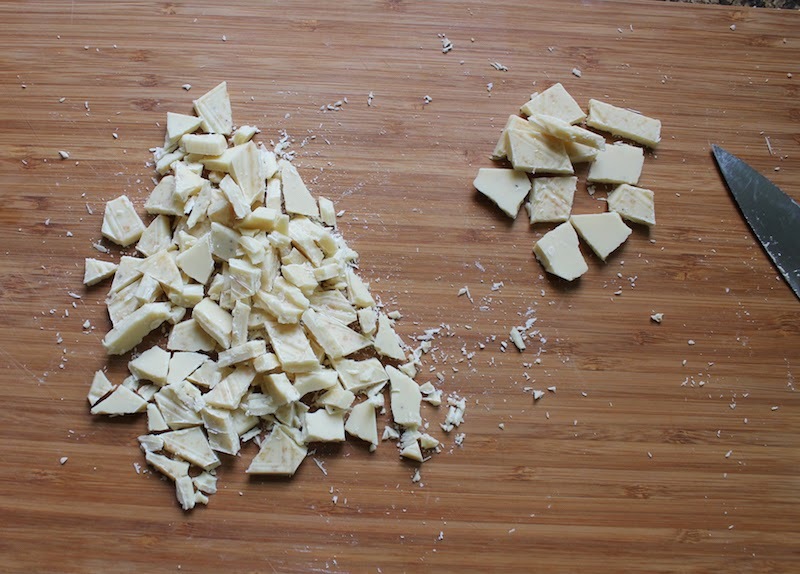 Chop your white chocolate bar roughly with a knife. 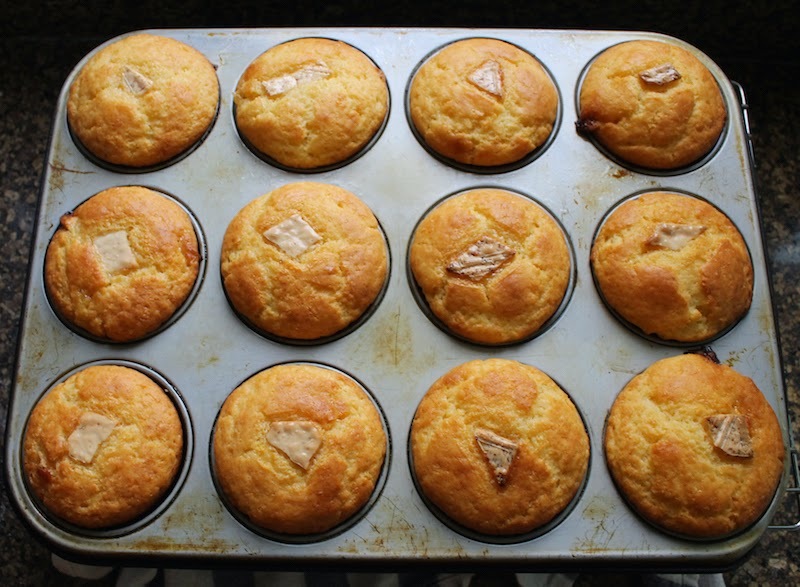 I separated out 12 pieces of white chocolate to poke in the top of each muffin before baking. They turned brown while baking, which is not attractive, so never mind that step. Fortunately, the glaze covered them up mostly. 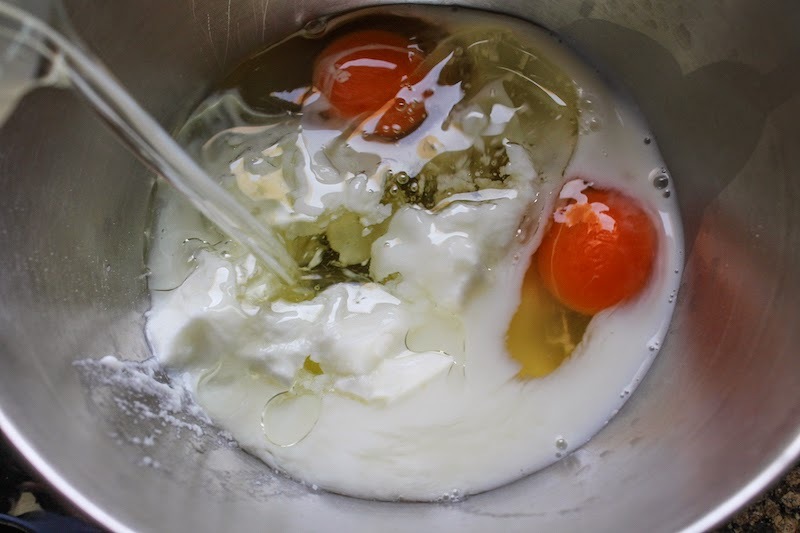 In another smaller bowl, whisk together the eggs, sugar, milk, yogurt, juice and canola oil. 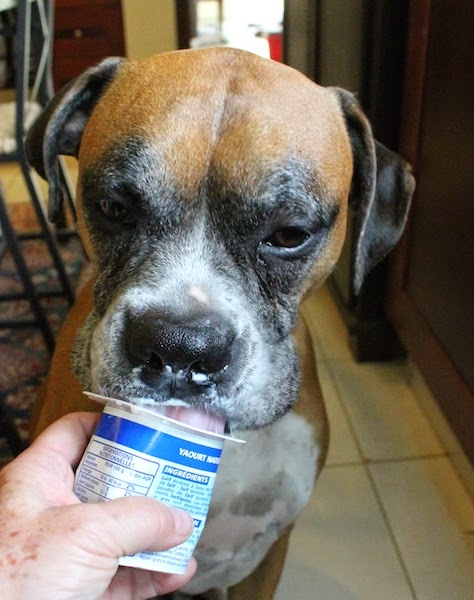 Let your helper clean out the yogurt pot for recycling. Pour the wet ingredients into the dry ones and stir until just mixed through. 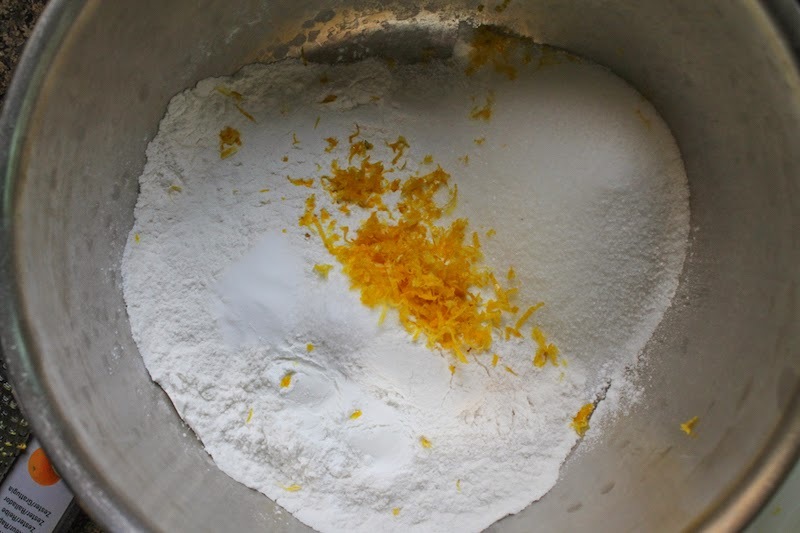 Or mix thoroughly if you are using a gluten-free flour blend. 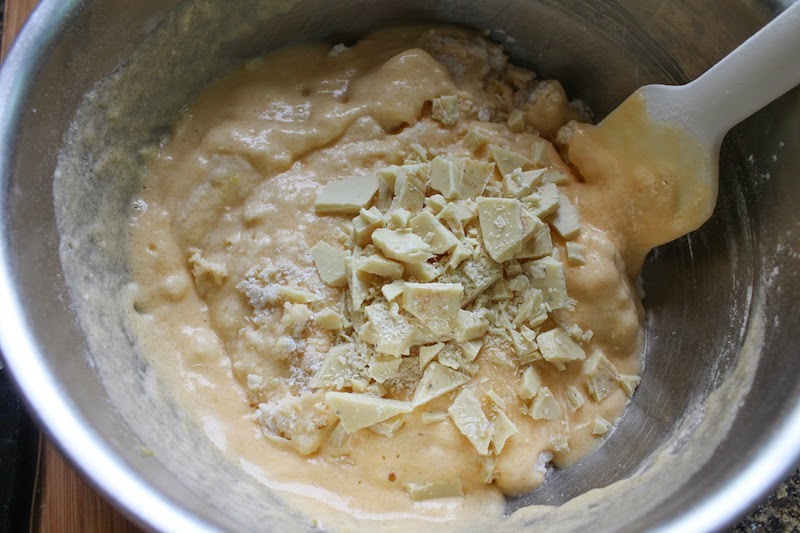 Fold in your chopped white chocolate/lemon bar. 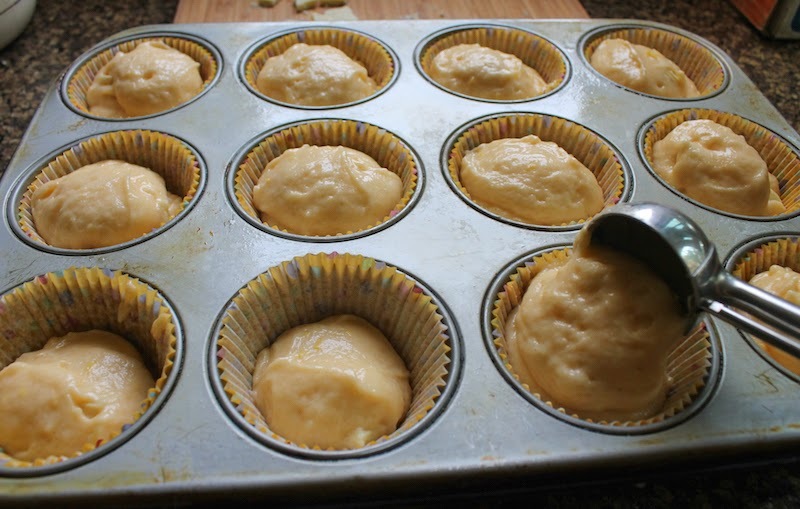 Divide the mixture between the muffin cups in pan. Bake in your preheated oven for 20-25 minutes or until golden. 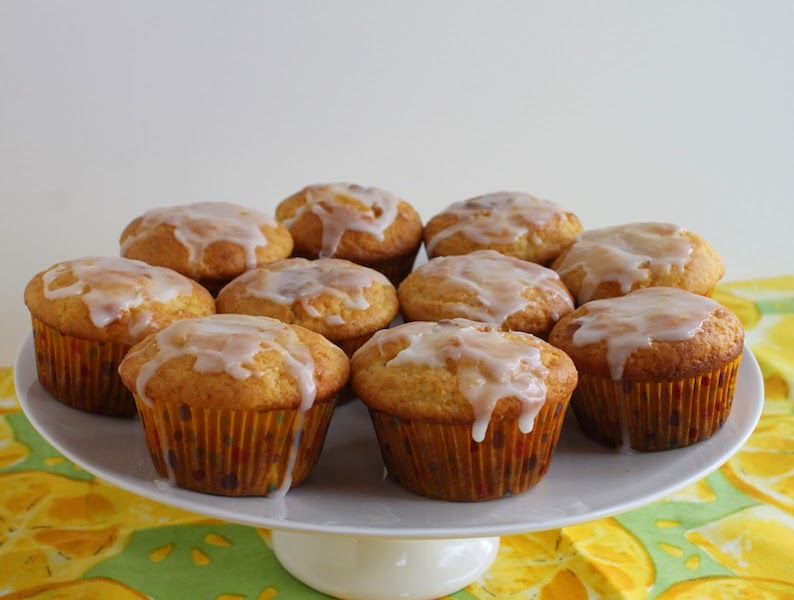 Allow them to cool for a few minutes then remove the muffins to a wire rack to cool completely. Ignore the chocolate bits I put on top, as previously discussed. 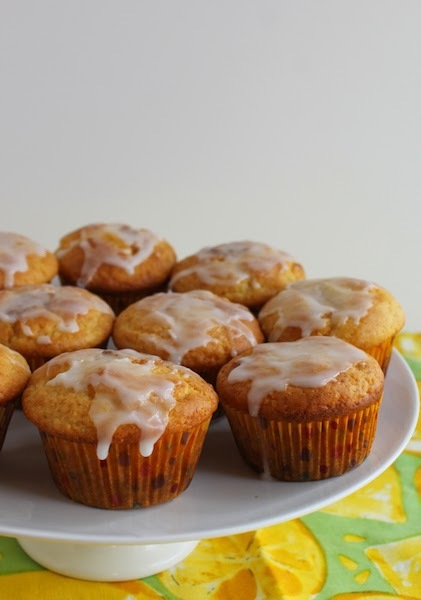 Those should be inside the muffins. If you want to add glaze, put your tablespoon of lemon juice in a small bowl. Add powdered sugar a couple of tablespoons at a time and stir well, until the glaze is a good drizzling consistency. 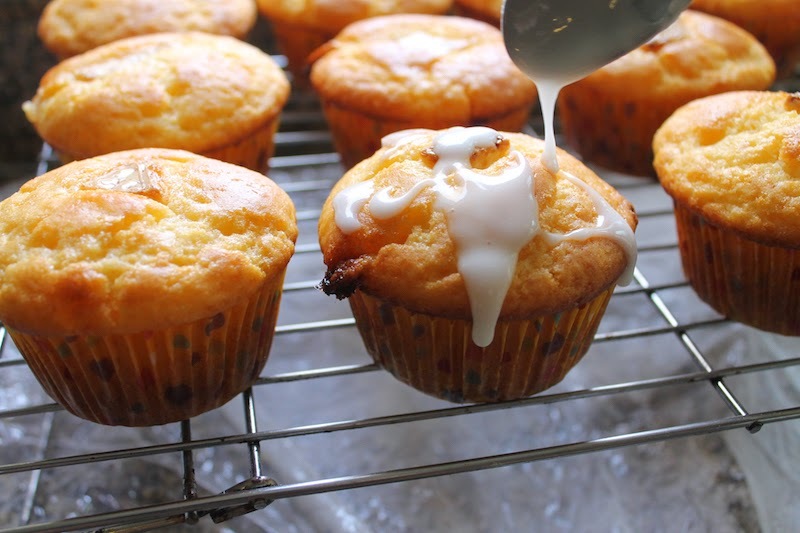 When your muffins are cool, drizzle on the glaze.